What you’re about to see is the world’s Smallest Stop-Motion Film and it was made by moving single atoms in a stop motion fashion. 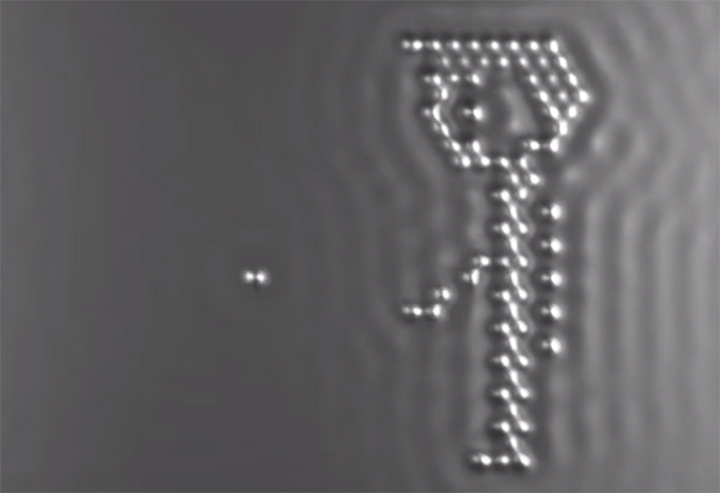 IBM researchers have created the film to demonstrate their ability to control single atoms. Something they will later use for their research into atomic memory. They used a scanning tunneling microscope to move thousands of carbon monoxide molecules (two atoms stacked on top of each other), all in pursuit of making a movie so small it can be seen only when you magnify it 100 million times. The ability to move single atoms, one of the smallest particles of any element in the universe, is crucial to IBM’s research in the field of atomic-scale memory. In 2012, IBM scientists announced the creation of the world’s smallest magnetic memory bit, made of just 12 atoms. This breakthrough could transform computing by providing the world with devices that have access to unprecedented levels of data storage. But even nanophysicists need to have a little fun. In that spirit, the scientists moved atoms by using their scanning tunneling microscope to make … a movie, which has been verified by Guinness World Records™ as The World’s Smallest Stop-Motion Film. Here you can see how they made it.